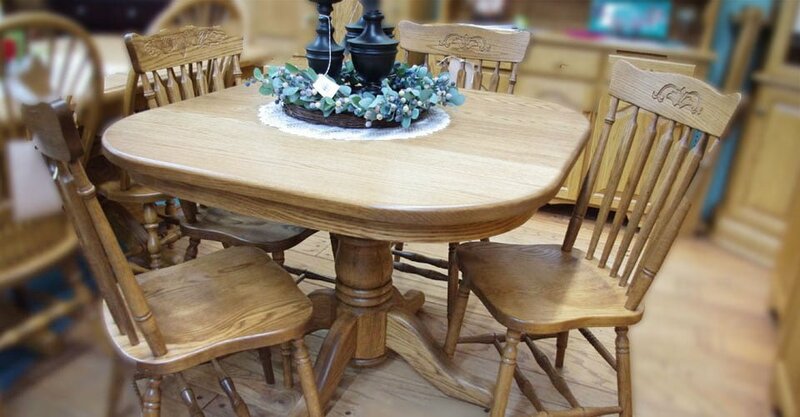 Our Country styled dining room sets are styled after the French Country and American Country Furniture of the 1800’s and is built using solid Oak wood. It is very simple, practical and easy to customize to your tastes. It is also available in Maple, Cherry and Wormy Maple wood and in your choice of stain colors. The tables have 1.25″ tops and the chairs are built with durability formost in mind so it will last for generations. SP54-Oak for Oak Rectangular Single Pedestal Table with 2-12″ext. 42w x 60L with 3" to 18" ext.